My wife and I joined another couple at Halutzim for a Purim feast. I picked the wines, even calling for the Gimonnet, which I didn't bring. But before we got to the wines we paid due corkage for, my friend Yossi at the table next to us sent over a glass of Maison Leroy, Bourgogne, 2009. As always, Madame Lalou knows how to choose wines for the Maison label, even if I do object to not knowing more about who grew the grapes and made the wine. This is a good Village level white of, to me, undecipherable origins, but the Domaine's Aligote of similar age would give it a good whipping. A good drop, an intellectual annoyance. 240 NIS at Burgundy Wine Collection. This always elegant Champagne show its intense side, while remaining complex and multidimensional, full of baked apples, mushrooms and brioche, almost a mini Krug. I'm lost for words to express my wonder at how great this is, and I'm a man who thrives on expressing how great wines like this are. Funky and reeking of sea weeds and granny apples. It's really hard to follow in the footsteps of the imminently classy and outré Gimmonet, so subjectively this felt undernourished - but this is really fine, complex and full of presence in its own right. A hint of cheese in the finish adds a a dozen seconds. Intensely spicy black fruit at first, an Nuits-St.-Georges for Barolo lovers? Even now, a joy to drink, but tannic and perhaps the youngest drinking and most intense 2008 I've had in ages. 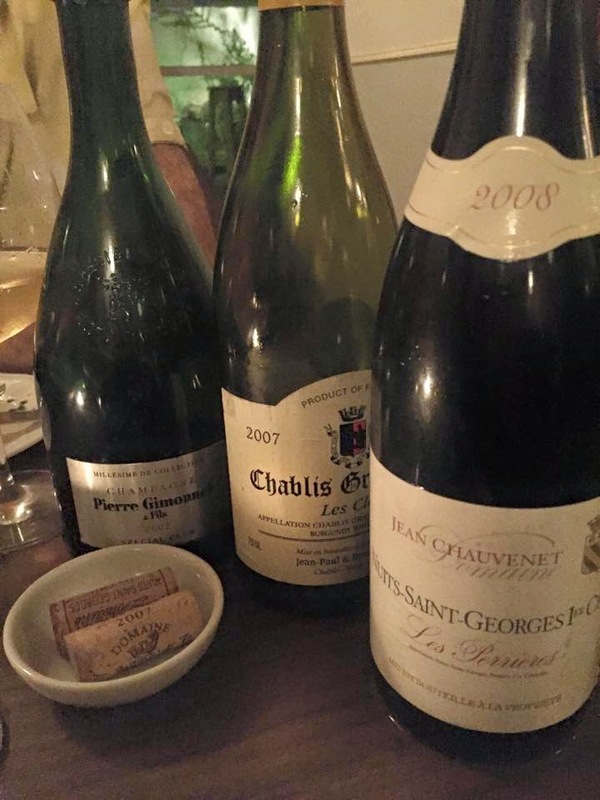 True to the Nuits mold if not the vintage's. This is tasty, long, complex with deep fruit, but I did not, definitely did not, expect that level of backward intensity in a 2008 Premier Cru. I'm so in love with this wine - definitely a wine to make me chase down another bottle so I can witness firsthand what it finally reveals. And then another friend offered a glass of Jaboulet, Hermitage, La Chapelle, 1982, which was an elegant village elder, black pepper highlighting the Syrah, and, at thirty three years of age, just as mellow a mature Bourgogne Grand Cru. An unexpected gift and a tasty pleasure.